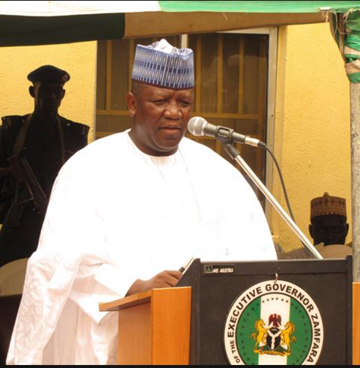 The Governor of Zamfara State, Abdulaziz Yari, has said that the current outbreak of Type C Cerebrospinal Meningitis, is God's way of punishing Nigerians over their fornication. While speaking with State House Correspondents at the Presidential Villa Abuja after a private meeting with President Muhammdu Buhari on Tuesday, Zamfara State Governor, Abdulaziz Yari, said that the outbreak of Type C Cerebrospinal Meningitis in the country was a direct punishment from God to the people of Nigeria for their various sinful acts. According to the APC Governor whose State appeared to be worst hit by the disease, God had always sent strange illnesses which had no cure to torment the people for turning their back on Him. Multiple reports had revealed that over 200 persons had died while several others are receiving treatment at various hospitals and clinics. The scary situation had also prompted some Medical Doctors under the aegis of Nigeria Medical Association, Zamfara state chapter to accuse the state government of not being proactive despite some warning. Yari said: “What we used to know as far as meningitis is concerned is the type A virus. The World Health Organization, WHO, has carried out vaccinations against this type A virus not just in Zamfara, but many other states. “People have turned away from God and he has promised that ‘if you do anyhow, you see anyhow’ that is just the cause of this outbreak as far as I am concerned. The governor who dismissed insinuations of non proactiveness by his government however said that he had called an emergency meeting of all stakeholders, ranging top state and local government officials to traditional rulers to address the issue, saying that “the meeting came out with a strategy to be adopted and the money required to deal with the outbreak and a lot of work is going on”. According to Yari, only 5 million dose of the vaccine against the Type C virus was available globally, adding that the dosage would not be enough for his state. He however stated that Federal Ministry of Health has only 50,000 doses of the vaccine, out of which 20,000 was given state. He said: “That is not enough for Zamfara people alone, not to talk of Katsina or Kano. Our Focus as a state now is to continue treating those who are infected with the disease, but as for vaccination, it has an international dimension. “We have information that Nigeria will get the highest percentage of the 5 million doses available now. Apart from WHO, other International bodies such as the Bill Gates foundation and UNICEF are also currently focusing on how to tackle the outbreak”. As a solution to the problem, Yari asked the people to repent from their sinful ways and embraced God, expressing optimism that the epidemic would be tackled. “The most important thing is for our people to know that their relationship with God is not smooth. All they need to do is repent and everything will be all right”, he said. Reacting to a question of whether it was only the people and not the leaders that needed repentance, Yari exonerated the leaders, saying there were only the messengers. “Leaders are doing their best by enlightening the populace and working assiduously for the good of all. “Your major assignment as a leader is to convey the message; you cannot go from house to House and arrest offenders for instance,” he said. 0 Response to "God is Using Meningitis Outbreak to Punish Nigerians for Fornication - Gov Yari Gives a Shocker"